My advanced degree is in counseling. I sought this degree due to my affinity towards at-risk and adjudicated youth. One of the most powerful learnings from my training as a counselor was a comment I heard at a conference, Counselors need to be purveyors of hope since many clients get in trouble and/or seek counseling due to a lack of hope. Hope is not just a feel-good emotion, but a dynamic cognitive motivational system. Under this conceptualization of hope, emotions follow cognitions, not the other way round. Hope-related cognitions are important. Hope leads to learning goals, which are conducive to growth and improvement. People with learning goals are actively engaged in their learning, constantly planning strategies to meet their goals, and monitoring their progress to stay on track. A bulk of research shows that learning goals are positively related to success across a wide swatch of human life—from academic achievement to sports to arts to science to business. In contrast to both self-efficacy and optimism, people with hope have the will and the pathways and strategies necessary to achieve their goals (The Will and Ways of Hope). Over the last 20 years, researchers have gained a clearer understanding of the relationships between hope and important aspects of students’ lives. Put simply, research demonstrates that more hopeful students do better in school and life than less hopeful students. Hope is positively associated with perceived competence and self-worth (Marques, Pais-Ribeiro, & Lopez, 2009) and negatively associated with symptoms of depression (Snyder, Hoza, et al., 1997). High-hope students typically are more optimistic (Snyder, Hoza, et al., 1997), develop many life goals, and perceive themselves as being capable of solving problems that may arise (Snyder, Hoza, et al., 1997). Accumulating evidence suggests that hope is related to life satisfaction and wellbeing (e.g., Gilman, Dooley, & Florell, 2006). Hope is linked consistently to attendance and credits earned (Gallup, 2009a). Hopeful middle school students have better grades in core subjects (Marques, Pais-Ribeiro, & Lopez, 2011) and on achievement tests (Snyder, Hoza, et al., 1997). Hopeful high school students (Gallup, 2009b; Snyder et al., 1991) and beginning college students (Gallagher & Lopez, 2008; Snyder et al., 2002) have higher overall grade point averages. Hope predicts academic achievement, and the predictive power of hope remains significant even when controlling for intelligence (e.g., Snyder, Cheavens, & Sympson, 1997), prior grades (e.g., Gallagher & Lopez, 2008; Snyder et al., 1991; Snyder et al., 2002), self-esteem (Snyder et al., 2002), personality (Day, Hanson, Maltby, Proctor, & Wood, 2010), and college entrance examination scores such as high school GPA and ACT/SAT (Gallagher & Lopez, 2008; Snyder et al., 2002). Belief in One’s Ability to Impact Positively on One’s Situation. Identify and prioritize their top goals, from macro to micro. Start by having students create a “big picture” list of what’s important to them—such as their academics, friends, family, sports, or career—and then have them reflect on which areas are most important to them and how satisfied they are with each. Breakdown the goals—especially long-term ones—into steps. Research has suggested that students with low hope frequently think goals have to be accomplished all-at-once, possibly because they haven’t had the parental guidance on how to achieve goals in steps. Teaching them how to see their goals as a series of steps will also give students reasons to celebrate their successes along the way—a great way to keep motivation high! Teach students that there’s more than one way to reach a goal. Studies show that one of the greatest challenges for students with low hope is their inability to move past obstacles. They often lack key problem-solving skills, causing them to abandon the quest for their goals. Tell stories of success. Scientists have found that hopeful students draw on memories of other successes when they face an obstacle; however, students with low hope often don’t have these kinds of memories. That’s why it’s vital for teachers to read books or share stories of other people—especially kids—who have overcome adversity to reach their goals. Keep it light and positive. It’s important to teach students to enjoy the process of attaining their goals, even to laugh at themselves when they face obstacles and make mistakes. Above all, no self-pity! Research has found that students who use positive self-talk, rather than beating themselves up for mistakes, are more likely to reach their goals. Parting Shot: I recently watched the documentary STEP, which provides a great example of administrators and teachers instilling hope into a high risk population. STEP documents the senior year of a girls’ high-school step dance team against the background of inner-city Baltimore. These young women learn to laugh, love and thrive – on and off the stage – even when the world seems to work against them. Empowered by their teachers, teammates, counselors, coaches and families, they chase their ultimate dreams: to win a step championship and to be accepted into college. This all female school is reshaping the futures of its students’ lives by making it their goal to have every member of their senior class accepted to and graduate from college, many of whom will be the first in their family to do so (http://www.foxsearchlight.com/stepmovie/). Due to the interest of my post The Other 21st Skills, I decided to discuss individually each of the skills or dispositions I proposed that are in addition to the seven survival skills as identified by Tony Wagner. 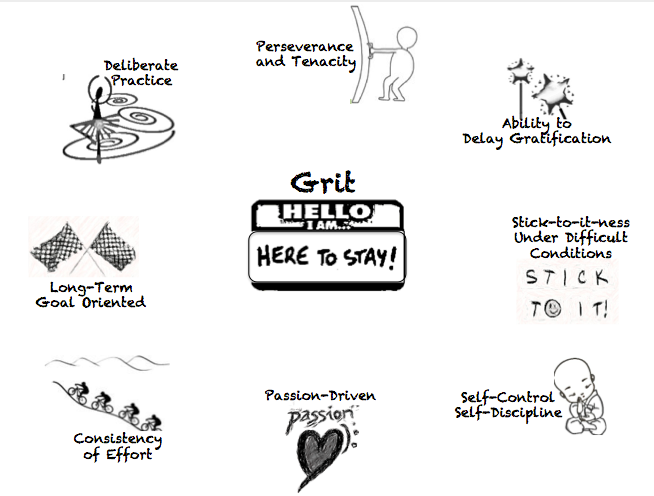 Here is Angela Duckwoth’s TED Talk about Grit that provides an overview about the topic. So how can Grit be taught or facilitated? 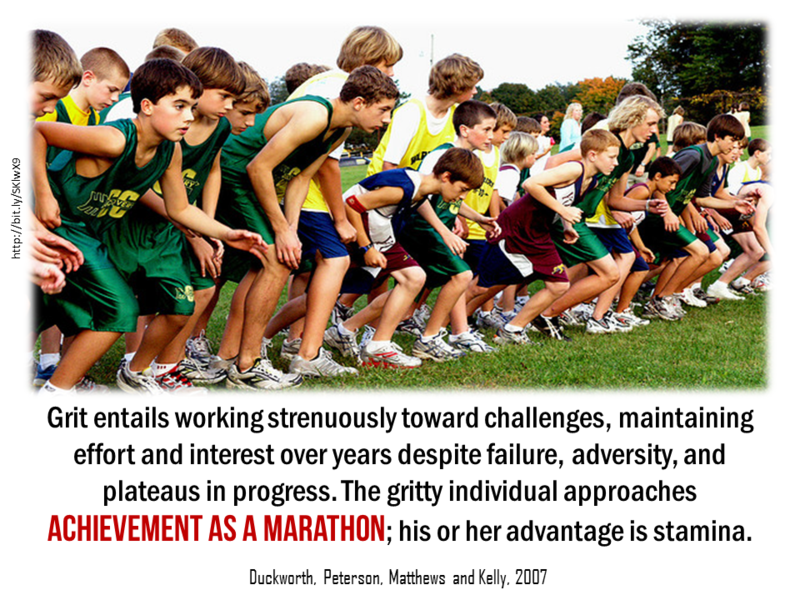 Awareness of grit can be brought more into conscious by first, teaching learners about grit and then by helping them reflect on their degree and level of grit. This can occur through discussions, writing or journaling, or through some form of artistic expression – a series of drawings, photos, or videos about examples of when and how they experience sustained and deliberate practice, consistency of effort, and ability to delay gratification. Grit can be practiced through having learners do long term project-based learning activities and/or working on long term independent studies based on their interests and passions. Grit can be reinforced though provide emotionally and intellectual support for grit-related behaviors. For grit to flourish, learners need to be given tangible resources. As a final note about promoting or facilitating grit, giving extrinsic based rewards does not help in developing grit. Help students develop a growth mindset. Foster safe circumstances that encourage grit. They resonated deeply and made sense to me. 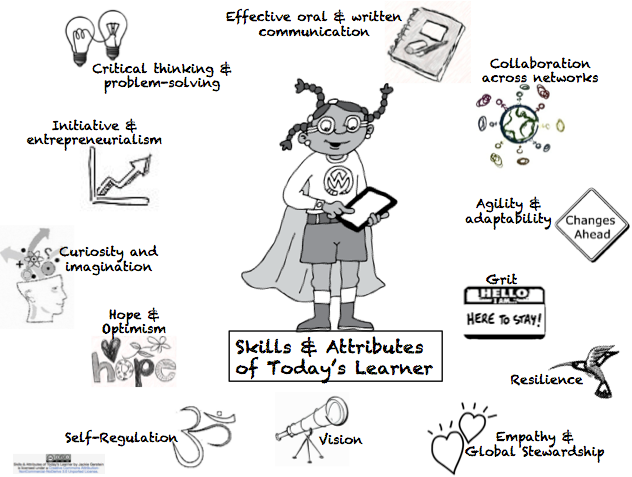 Instructional strategies and learning activities should build in ways for learners to get these needs met. Freedom – This is the need to choose how we live our lives, to express ourselves freely, and to be free from the control of others. Helping students, especially younger ones, satisfy this need does not mean giving them the freedom to do whatever they want to do. It is giving them the freedom to choose. Learner agency is “the capability of individual human beings to make choices and act on these choices in a way that makes a difference in their lives” (http://en.wikipedia.org/wiki/Structure_and_agency). As related to the needs as identified by Glasser, elements of freedom, choosing how we want to live our lives, and power, choosing what and how to learn, address learner agency. Schwartz and Okita developed the following table to compare and contrast high versus low agency learning environments. A direct connection can be found between self-directed learning, learner agency, and emotional intelligence. Learner agency leads to increased feelings of competence, self-control, and self-determinism; and higher emotional intelligence. Bandura (2001) highlights the role of agency in the self-regulation of learning: “The core features of agency enable people to play a part in their self-development, adaptation, and self-renewal with changing times” (p. 2) (in Lindgren & McDaniel, 2012). Boyatzis (2002) connected self-directed learning and emotional intelligence, which he discussed extensively in his article Unleashing the Power of Self-Directed Learning. He specified some signposts of self-directed learning. Has the person engaged his/her passion and dreams? Can the person articulate both his/her strengths (those aspects he/she wants to preserve) and gaps or discrepancies between those aspects he/she wants to adapt or change? Does the person have his/her own personal learning agenda? Is it really his/her own? Can the elements of the plan fit into the structure of his/her life? Do the actions fit with his/her learning style and flexibility? Is the person experimenting and practicing new habits and actions? Is the person using their learning plan to learn more from their experiences? Has the person found settings in which to experiment and practice in which he/she feels psychologically safe? Is the person developing and utilizing his/her relationships as part of their learning process? Does he/she have coaches, mentors, friends, and others with whom they can discuss progress on their learning agenda? Is the person helping others engage in a self-directed learning process? Learner agency is feasible in educational settings, both formal and informal, given this Internet age of information abundance and ease of access, and the use of social networks for personal learning. The final piece of this discussion focuses on leveraging technology to enable, elicit, and encourage learner agency which in turn builds emotional intelligence. Technology presents new opportunities for drawing out and leveraging student agency. One of the ways that technology accomplishes this is by personalizing the learning experience, allowing students to work at their own pace and being responsive and responsible to their own individual needs. (Corbett, Koedinger, & Anderson, 1997, in Lindgren, R., & McDaniel, R. (2012.). As Magni (1995) noted in her dissertation, if we combine the principles of learner-centered pedagogy, the methods of participatory design and the flexibility offered by the Internet, educators can use technology not as a prescriptive learning tool but as one that enables students and teachers to gather material, manipulate and alter resources to design environments that are suitable and appropriate for the learners. What follows are some general ideas for using technology to encourage self-directed learning, learner agency, self-regulation, and self-determinism. Create a database of student passions, interests, hobbies. Share the list with the students so they can connect with one another. Offer students a variety of different ways to learn content material – video, audio, online readings, games. Let them choose ways to learn it. Invite students to add to the resource archive. Ask students to curate a subtopic within the larger topic being covered based on their own interests. Offer a choice of online curation tools (e.g., Scoop.it, Pinterest, MentorMob, Diigo) for them to use. Encourage students to set personal goals for themselves for the class. Provide some online options (e.g. 8 Online Goal Progress Tracking Tools) or apps (15 Fantastic Apps to Track & Manage Your Goals; Goal setting Android Apps; ) to track progress. Ask students to find an expert in their area of interest via a social media and attempt to make contact via Twitter, Facebook, Skype, etc. Assist students in developing their own PLNs using social networking sites of their own choosing (Facebook, Instagram, Tumblr). Allow students to express what they learned in a way that works for them. A list of ideas can be found at A Technology-Enhanced Celebration of Learning. Ask students to publish and share their work with their own networked public. Implement a peer feedback process; where groups of peers develop their own grading criteria and use this criteria to review one another’s work. Ideas for others – please let me know. Boyatzis, R.E. (2002). Unleashing the power of self-directed learning. In R. Sims (ed. ), Changing the Way We Manage Change: The Consultants Speak. NY: Quorum Books. Retrieved from http://www.eiconsortium.org/reprints/self-directed_learning.html. Lindgren, R., & McDaniel, R. (2012). Transforming Online Learning through Narrative and Student Agency. Educational Technology & Society, 15 (4), 344–355. Magni, P. (1995). The design and development of a hypertext environment for adult learners of Italian. Doctoral Dissertation. Schwartz, D. L, & Okita, S. The Productive Agency in Learning by Teaching. The Social Skills Place. (2010). 4 Basic Psychological Needs That Motivate Behavior. Retrieved from http://www.socialskillsplace.com/archive/0410.newsletter.html.